Michael Cragin with his 15-month-old English bulldog, Truman. Cragin's dog is giving out free hugs as a way to help the community heal from the school shooting tragedy at Newtown, Conn.
NEWTOWN, Conn. -- Retired special education teacher Michael Cragin couldn't sleep Friday night, thinking about the tragedy that had struck his community and claimed the lives of 20 children at an elementary school. 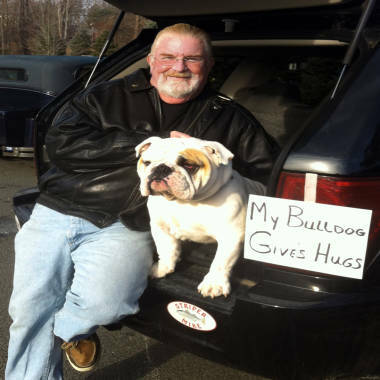 He wanted to do something to help, and when he saw his English bulldog, Truman, Saturday morning, he suddenly knew what he could do: his beloved canine could offer the grieving members of Newtown a hug. “It's the type of thing that people will for that brief second leave the nightmare behind, just to hug him, and that's what I was hoping on, because I don't know what else to do,” Cragin said, recounting how two teenagers girls stopped crying for a moment as they hugged Truman. Cragin, who has lived in Newtown for 30 years and had also been a volunteer firefighter, said he believes he will know some of the families who lost a loved one since it's such a small, tight-knit community. Cragin and Truman got down to the Dunkin' Donuts, where he knew there would be consistent traffic, at 7 a.m. By late morning, Truman had given out more than 100 hugs.